Get Your Kicks On Route 34! Scale signs, printed in color on thin plastic for easy assembly. Each set of signs includes scale posts, CAD designed to Federal Specifications for accuracy and authenticity. 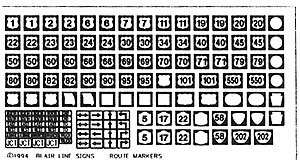 Copy this Highway Signs – US Highway Route Markers to your MY ACCESSORIES roster.